Australia – a wonderful country, which is most often associated kangaroos and local indigenous people (Aborigines). However, the state is fraught with many more interesting sights that everyone should see. 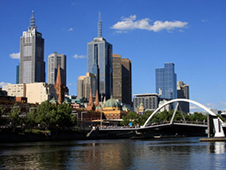 Cultural capital is the city of Melbourne, which combines historic architecture with modern masterpieces entertainment centers. It is a true paradise for shopping – shopping malls selling goods, souvenirs and clothing from manufacturers. To experience this unique atmosphere, will certainly use the service of car rental in Melbourne. The main places for rental deemed central part of the city – and Futskray Werribee and Melbourne Airport, which is especially convenient. It is possible to reserve for itself the vehicle, place an order online http://bookingcar.ru. In the city - 60 km / h.
On the territory of Melbourne are the same traffic rules as the rest of Australia, the main feature - moving cars on the left side. Passengers are required to wear seat belts and children may be transported only in special car seats. Using your phone while driving is strictly prohibited. The municipal (city-owned, along the road). Private parking rules are simple. You can reserve a place for your car online, buy a monthly subscription or come here at any time (you have to search for free space). Each municipal park have information about the cost and location of the machine rules. For cars watching sensors and if the driver violates the rules, the inspector writes him a fine. After 20.30 - free of charge. In the city there are toll roads and bridges, for example Bolte Bridge. In order to pay for the travel, you must use a special electronic device, which is located on the panel in the car and reads. The driver gets for itself by periodically replenish it. The maps toll roads are marked in red and purple hues. For non-payment of the fine is charged a fine (up to $ 1), but added to it a certain amount of taxes in the amount obtained impressive, even for a few minutes.